Figs, with their exotic appearance and sweet, rich flavor, seem as if they should be much more difficult to grow than they actually are. Figs grow well in all but the very coldest areas, and, even in colder zones, figs can be grown in containers and sheltered over the winter. If you're interested in growing fruit organically, figs are a great place to start because they need very little in the way of fertilization and are not bothered by many pests and diseases. In most areas, figs can be planted directly into the ground and grown as large trees. They need a full eight hours of sun to produce well, and a sheltered area is best, to protect them from harsh weather. The south or southwest side of your house is an ideal spot. 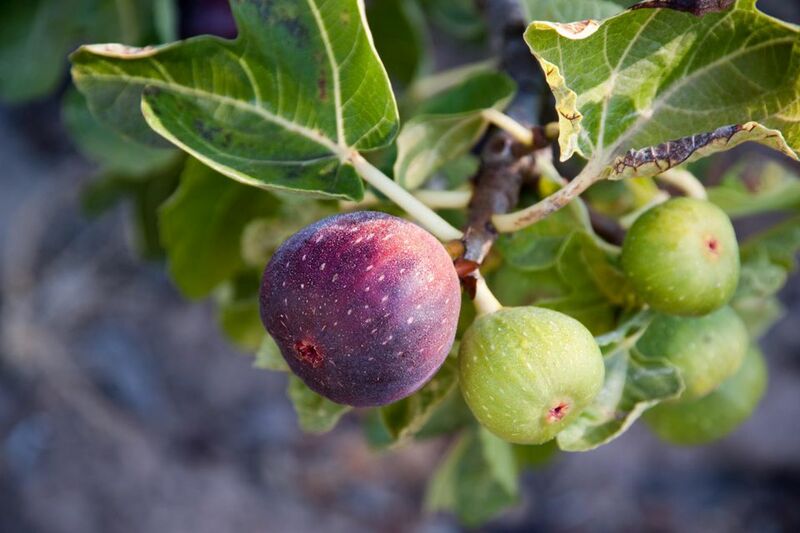 In zones six and above, you can generally plant right in the ground and get a good crop of figs. In zones five and below, growing in a container (which you can shelter in a covered porch or garage during the winter) is probably your best bet. However, there are cold-hardy figs available on the market; just make sure they are hardy in your zone. It is generally recommended that you plant figs an inch or two lower than they were growing in their original nursery pot. This helps protect the shallow root system from temperature extremes and drought, and will not harm the plant. If you are planting in containers, use a pot that is at least eighteen inches across and at least a foot deep. Fill it with a good quality organic potting soil, and, if at all possible, leave three to four inches of space between the top of the soil and the rim of the pot. This will allow for plenty of space to topdress your fig with compost every spring. Any pot you use should have good drainage; make sure there are plenty of drainage holes so your fig doesn't become waterlogged and rot. Whether you are planting in the ground or in a pot, you should not add any additional fertilizer to the soil at planting time. This will just result in lots of weak, bushy growth. Figs are really mostly care-free. For the most part, you'll want to concern yourself with making sure that your fig gets enough water (at least an inch per week for those planted in the ground, and as needed for those planted in containers) and keeping an eye out for any pests or diseases. Each spring, topdress the soil around your fig with an inch or two of compost. This is all the fertilization your fig will need. Additional fertilizer will result in lots of leaves and no fruit production. However, if you notice that the plant doesn't seem to be producing many leaves, feed it with manure tea or fish emulsion in early summer. If you are growing your fig in the ground, you can train it against a wall or fence to make it easier to harvest and to protect the branches from the elements. You don't really need to prune figs planted in the ground, other than to remove dead branches. If you are growing your fig in a container, don't prune during the first year. Starting in the second year, you can cut each branch down by about half to keep the plant manageable. Just make sure that you are making your cuts above a node to encourage lateral growth and fruit production. Figs really aren't bothered by many pests and diseases. Root-knot nematodes can be a problem in some areas. These soilborne pests are not usually detected until plant vigor has been affected. The nematodes attack the roots, causing galls which prevent adequate water and nutrient uptake. The best way to prevent it is to be sure to plant in nematode-free soil—a soil test is the best way to ensure that yours is nematode-free. The other major problem you'll deal with is birds and other animals going after the nearly-ripe fruit. You can protect your fruit with netting or cages covered with floating row covers until the fruits are ready to harvest. Figs are ready to harvest when the "neck" area (the narrow area where the fruit connects to the plant) starts to shrivel a bit and the fruits droop on the plants. If, when you pick them, you notice a milky liquid coming from the stem, they are not quite ripe yet. Wait a couple more days to harvest any others. This liquid can irritate the skin, so you may want to wear gloves when harvesting. If you haven't tried growing figs yet, give them a try. They are one of the easiest fruits to grow in your garden.